1) Widen your world by working in a restaurant. Let’s face it, people who work in restaurants come from all sorts of backgrounds, educational experiences, and world cultures. Restaurant people can be, well…colorful. I have had the pleasure of working side by side with doctoral students, former circus performers (really), and people who speak several languages. Where else can you experience such diversity? 2) Become a better customer by working in a restaurant. You’ll never know how truly hard it can be to juggle all the demands of food service until you try it. You will then have a better perspective to rate the quality of the service you receive. Human nature tends to be easier on ourselves than we are on other people, but by walking in someone else’s job, we can better appreciate those who do a great work. 3) Burn calories by working in a restaurant! This can often be a very physical job that is hard to appreciate until you do it. Restaurant work has very few sit down jobs, a great bonus to those who tend to be sedentary. 4) Try new foods by working in a restaurant. You will be exposed to all sorts of items that you don’t normally eat. My first restaurant job (at Valentino’s in Topeka) was restocking the salad bar. It gave me the opportunity to try many new flavors, as I was alone and unsupervised in the walk-in cooler. Maybe you won’t get to eat all the Andes chocolate mints that you can during a shift, but you will likely try some new tastes. 5) Save money on food by working in a restaurant. One of the benefits of restaurant work is free or reduced price food when you work. Yes, you will eventually get tired of the options available, but then you will eat less food and be happier with your weight. Did I mention that we are hiring at Esquina? Opening date coming soon! 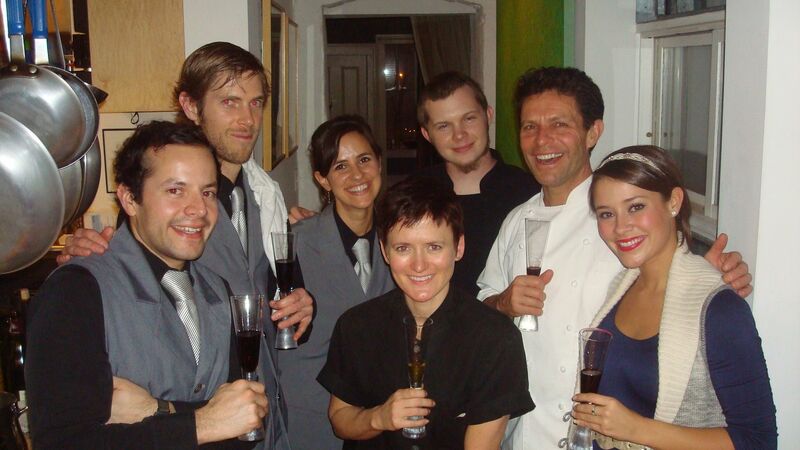 Our restaurant people from Krause Dining on our last night of service – I miss working side by side with them daily. Patience, tolerance, diplomacy and serious multi-tasking skills are other side benefits of restaurant work, but it’s the ability to stay cool under pressure that I value most. Looking forward to Esquina. Speaking of which, how would one go about applying for a position at Esquina? Go to The Burger Stand at Dempsey’s and talk to Chris (front of the house) or Simon (kitchen). Molly, your staff at the old place was just wonderful. As much as I used to gush about the food, the same reviews were provided for the service. I miss it too, but I cannot see myself becoming an accountant. I can feel my blood pressure rising just at the thought! Amen on the becoming a better customer. . . Even been out to dinner with people that you know right away have never been in the industry?